An inscribed first edition of Jane Austen's novel Emma has fetched a record £180,000 at a London auction. The three-volume set inscribed on behalf of Austen to Anne Sharp, her friend and governess to her niece, was sold at Bonhams to a telephone bidder. Of 12 presentation copies sent by Austen's publisher, it was the only one given to a friend of the author. The book, first published in 1816, tells the story of Emma Woodhouse and her matchmaking exploits. The price was a new world record auction price for a printed book by Austen. The British vendor, who wants to remain anonymous, is descended from a family that married into the family of Richard Withers, who was left property belonging to Ms Sharp when she died. They said: "The family are delighted with the price fetched today. The novel had been sitting in my family library for at least three generations." Austen gave nine presentation copies of Emma to family, one to the library of the Prince Regent and one to a countess. Ms Sharp's was the only one given to a personal friend - a demonstration of the bond between the two women. They became friends while Ms Sharp was working as governess to the author's brother Edward, and remained close for many years. 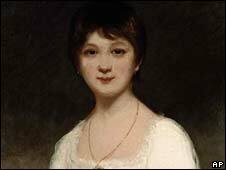 For the novel, Austen created a governess character called Miss Taylor. Set in Regency England, the novel's heroine, a young woman aged 21, is described in the opening paragraph as "handsome, clever and rich", but also "slightly spoiled". In March, Bonhams sold a rare, inscribed first edition of JRR Tolkien's The Hobbit for a world record-breaking £60,000. And in November last year, it sold a first edition of Emily Bronte's Wuthering Heights for £114,000.